Wolf Commercial Real Estate, a premier Cherry Hill commercial real estate broker that specializes in Cherry Hill commercial real estate listings and services, is now offering well-located Cherry Hill retail space for lease at 2080 Route 73 East Cherry Hill NJ. The asking lease rate for this retail space in Cherry Hill NJ is $15.00 per square foot NNN. This Cherry Hill retail space for lease is available for immediate occupancy. In addition, there is an open floor plan at this Cherry Hill retail building for lease. This Cherry Hill retail building for lease has 5,748 square feet space available and this retail space in Cherry Hill NJ sits on a well-maintained and landscaped property. This retail space for lease in Cherry Hill NJ at 2080 Route 73 East Cherry Hill NJ is close to many high-traffic retailers. The average annual household income is $105,045 within a five-mile radius of this this Cherry Hill retail space for lease through Wolf Commercial Real Estate, a Cherry Hill commercial real estate brokerage firm that specializes in Cherry Hill commercial real estate listings and services. There is abundant parking at this Cherry Hill retail building for lease. An average of almost 46,000 vehicles per day pass by 2080 Route 73 East Cherry Hill NJ. This Cherry Hill retail space for lease is in a high-demographic area of the township and also, this retail space in Cherry Hill is close to Route 73, the New Jersey Turnpike and Exit 34 of I-295. 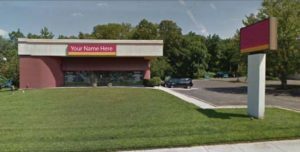 More than 201,000 potential customers live within five miles of this Cherry Hill retail building for lease at 2080 Route 70 East Cherry Hill NJ. This retail space in Cherry Hill offers freestanding pylon and storefront façade signage. For more information about this Cherry Hill retail space for sale at 2080 Route 70 East Cherry Hill NJ or about any other Cherry Hill commercial properties for sale or lease, please contact Jason Wolf (856-857-6301; jason.wolf@wolfcre.com) or Christopher Henderson (856-857-6337; chris.henderson@wolfcre.com) at Wolf Commercial Real Estate, a Cherry Hill commercial real estate broker. Wolf Commercial Real Estate, a full-service CORFAC International brokerage and advisory firm, is a premier Cherry Hill commercial real estate broker that provides a full range of Cherry Hill commercial real estate listings and services related to this retail space in Cherry Hill NJ. Wolf Commercial Real Estate also offers property management services, and marketing commercial offices, medical properties, warehouse properties, industrial properties, land properties, retail buildings and other Cherry Hill commercial properties for buyers, tenants, investors and sellers. Please visit our websites for a full listing of Cherry Hill commercial properties for lease or sale through our Cherry Hill commercial real estate brokerage firm.